Last night the Austin City Limits television stage was graced by the presence of two living legends. One is 62 years old and one is part of a 62 year old musical legacy. 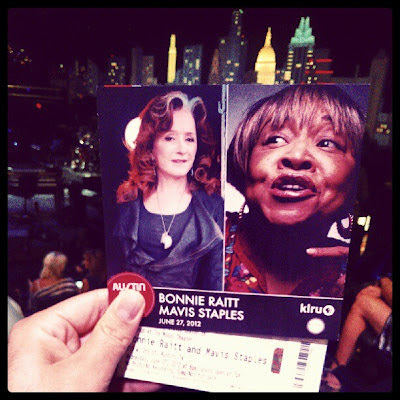 Bonnie Raitt and Mavis Staples are touring together and I was lucky enough to witness a split taping by these two women. Bonnie Raitt started things off playing a set that was slightly longer than an hour, showcasing lots of material from her latest record Slip Stream while stil peppering her set with some of her most famous songs. The red-headed star, dressed in high heels, flared jeans and a striped shirt was making her third appearance on the show, thirty years after her first visit. She was very comfortable on the stage but still noted how appreciative she was to be there. Bonnie sang with grace and ease, her voice does not age it is still as clear and beautiful as ever with a timbre that can alternately exhilerate you or break your heart depending on the song. She brought both Mr. S. and myself to tears on separate occasions with the shear power of her voice. "Maybe we did this on a previous show but I don't care because I haven't been 62 before." That received a huge roar of approval from the crowd. All in all, those of us who were in the audience last night received quite the treat with at least 30 minutes worth of material that won't air. Mavis Staples had the second set of the evening. She took to the stage with a 3-piece band and 3 backup singers. They started their set with a gospel standard using only their voices and hand claps, which really set the mood for her set. Mavis was charming and she sang beautifully. She played material both old and new including a few songs from her Jeff Tweedy produced album. 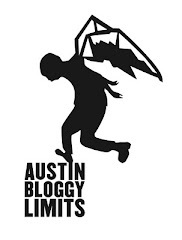 Staples noted that she had never playing Austin City Limits before but now that she has she's finally made it. The crowd reacted by giving her an extending standing ovation. The biggest highlight of Staples' set was her 15 minutes, gospel rendition of I'll Take You There. As soon as the song began two middle-aged men in front of me stood up and fist bumped then proceeded to dance like no one was watching. The song felt like it belonged to all of us, it's so a part of our pop culture it seems strange to think that I was in the same room with its original singer. After Mavis Staples' set, she left the stage then returned with Bonnie Raitt. The two singers discussed their past and talked about how they feel like sisters. Then they performed two songs together culminating in an uplifting rendition of Let the Circle Be Unbroken. To be at the Moody Theater for last night's show was truly a blessing. The show started at 8pm, we left at 11pm and that has to be condensed into a 1 hour show. I do not envy the editors. Raitt and Staples will continue to tour together this fall so, if you're reading this from outside of Austin click that tour link to see if you can catch the show in your area.